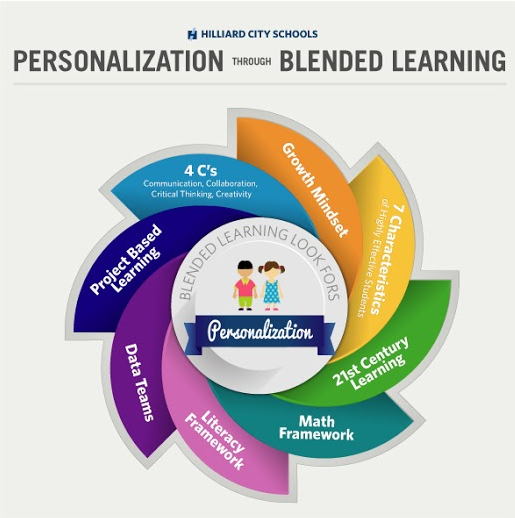 The graphic above that was shared with everyone during our first staff meeting of the year helped to generate great conversation about what it means to personalize education. We discussed some of the approaches that we are doing that support personalizing education and ones that we need to strengthen. One point we shared during this time was that we are all at different points on this journey towards personalizing education, but that it is important that we are all on this journey together. We also agreed that we will never “arrive” – Education constantly changes. Taking steps towards personalizing are important because as we discussed, the world is becoming personalized place. Some are worried about the challenge of personalizing education for 25-30 students and I agree this is a challenge. However, something we need to remember is that we don’t have to do personalize education alone. We have partners out there that will help us personalize education for kids and these partners are parents. Parents want to be able to help their child have access to an excellent learning experience. In order for us to do that we have to be able to meet parents where they are and to do that we need to find out what they need. I am proud that our community has responded to this need and recognized an opportunity to connect with parents through a re-imagining of a traditional school event. On September 16th, we will be hosting our 1st Parent EdCamp/Curriculum Night, a night where parents get to choose a learning experience that fits their needs as a family to better support their child. For us educators, this night is a prime opportunity to build partnerships with families that, if sustained throughout the school year, can help us get closer to achieving a personalized learning experience for each of our students. We have the chance to go beyond bullet points and Powerpoint presentations and truly provide parents with what they need to know more about to better help their child. I am excited about this opportunity to take our partnerships with parents and our efforts to personalize education to a new level! Sept 14 – PTO General Meeting — Staff: Don’t forget to sign-up to host a snack and join us for the PTO Meeting! See Jillian for more information. Sept 16 — Parent EdCamp/Curriculum Night! 5:30-7:00pm; see Heather or Herb for more details. Oct 5-9 — Fall Conference Week, Conference Night is Oct 7.